I finally got it. At 5:00 a.m. on the last day of the Copenhagen plenary approval session for the IPCC Synthesis Report (SYR), I understood what synthesis is all about. It struck me during a hot cocoa break in the hotel lobby, watching sleep-deprived co-authors and delegates continue discussions in a last-ditch effort to reach agreement on contentious text. I realized that synthesis is a process, not an outcome. Like many members of the Core Writing Team for SYR, I was committed to producing a document that would present something new — the whole story on climate change. After all, a synthesis is by definition a process of combining diverse parts or concepts into something that is larger and more coherent. Our “something” was supposed to be a short, readable report bringing together findings from all three IPCC Working Groups, pulling together the output of thousands of hours of collaboration among hundreds of scientists. The SYR was to explain to the world why we need to care about climate change, and why it truly matters. With a focus on a synthesis product, I co-facilitated the topic on “Transformations and Changes in Systems.” This was easier said than done. Transformation as a concept is largely invisible in the underlying reports, and not surprisingly it fell through the cracks in the synthesis report. From the start, we had trouble collectively seeing how transformation related to the findings of the IPCC reports, and it was thus difficult to create a coherent narrative around it. Many people are understandably skeptical of using a concept that is both powerful and political, and wary of its implications. Yet when discussing climate change and the potential impacts of 1.7 to 4.8°C warming on natural systems and human systems in this century, we are in fact talking about transformations, especially in relation to food systems, urban populations, livelihoods, ecosystems, and human security. Likewise, when we are debating substantial reductions of greenhouse gas emissions to limit warming and minimize sea level rise and ocean acidification, we are talking about transformations. Even when planning how to adapt to the changes that are expected to occur over the next decades as a result of past emissions, we are often talking about transformations. Every climate change policy and action is inevitably about the type of transformations that are we willing to live with, and which ones we choose to pursue. 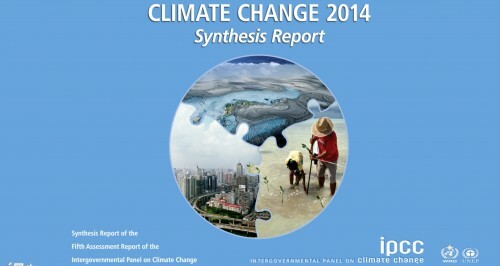 The Synthesis Report topic about strategic perspectives on climate responses was eventually more appropriately renamed “Future Pathways for Adaptation, Mitigation and Sustainable Development,” and with the exception of a bullet point on transformations and transformational adaptation, the report avoided direct mention of the word transformation. Many other words were used to describe the risks and the options we have to avoid “severe, widespread and irreversible” impacts of climate change. Yet with transformation absent from the synthesis product, it seemed to me that we were missing the bigger picture. Until my “hot cocoa” moment, I did not relate the synthesis process itself to a larger, ongoing transformation. Bringing together new data, information, and understandings based on a diversity of perspectives slowly penetrates our thinking, disrupts the stories that we tell ourselves, and challenges us to expand our individual and shared identities. The struggle to hold on to current identities and interests was voiced throughout the plenary approval sessions, but so were concerns about the future. What is our future as a small island state, as sea levels rise? How will we feed our people when climate change is leading to more extreme, extraordinary events? As an oil exporting nation, where will our income come from with substantial mitigation? What can we do as a small but capable country to influence future pathways? Identities do not transform easily, and it is not surprising that delegations wanted the report to better emphasize their own stories. Yet after five days of intense discussion and debate, the topic headline still conveys the clear message that “substantial emissions reductions over the next few decades can reduce climate risks in the 21st century and beyond, increase prospects for effective adaptation, reduce the costs and challenges of mitigation in the longer term, and contribute to climate-resilient pathways for sustainable development.” This may not be considered a “new” headline by everyone, but it captures in a nutshell why our strategic choices make a difference. The Synthesis Report is done, but the synthesis process continues. Transformation will occur as people hear the key messages and relate them to their own contexts. Unlike a mere summary that can be formed by cutting and pasting from what we already know, the synthesis story is still being written – the coherent whole is continuously being formed in our heads and hearts. Synthesis is transformation. Following on SYR, we are now challenged to move beyond “business as usual,” pull together information from disparate sources, and synthesize climate change into a successful story of transformation.